Scarcity has been a defining feature of human existence, driving economies by making goods in limited supply more expensive than those that are abundantly available. But scarcity has been built into our way of doing business because we view resources as entirely Earth-bound. That could soon change. Today, a group of entrepreneurs are beginning to think that asteroid mining could help eliminate the scarcity of some resources and make some people insanely wealthy at the same time. But is this just a pipe dream? Neil deGrasse Tyson doesn’t seem to thinks so. To put it mildly, asteroid mining is going to be complicated. Yet despite myriad complexities, a handful of private companies—including Deep Space Industries, Kepler Energy & Space Engineering, and Planetary Resources—have started to draw up plans to get into the asteroid mining game. Regardless of who gets their hands on an asteroid first, the methods used to get to that point will likely be similar. The first step in an asteroid mining operation involves cataloging and selecting an appropriate target. Using telescopes, mining firms will scout the skies looking for near Earth asteroids with a relatively low velocity (5.5-8.0 km/s). Once a few suitable targets have been identified, they’ll likely be classed into one of three categories: C-type, S-type, or M-type. C-type asteroids are primarily of interest because they contain an abundance of water, carbon, and phosphorous that could be used to support colonies or larger mining operations where humans are running part of the show. While these asteroids aren’t the most immediately profitable, they could be critical components of long-term, off-world endeavors. Although C-type asteroids do have their value, it’s likely that they won’t be the primary targets for would-be asteroid miners. That distinction falls to the last two classes. S-type asteroids distinguish themselves by having an abundance of precious metals. M-type orbs are also heavy with metals, but they contain about 10 times more elemental pay dirt than their S-type brethren. It goes without saying that a for-profit company would be drooling all over itself if it could snag either an S- or M-type rock first and leave the C-types for after the loot is already rolling in. 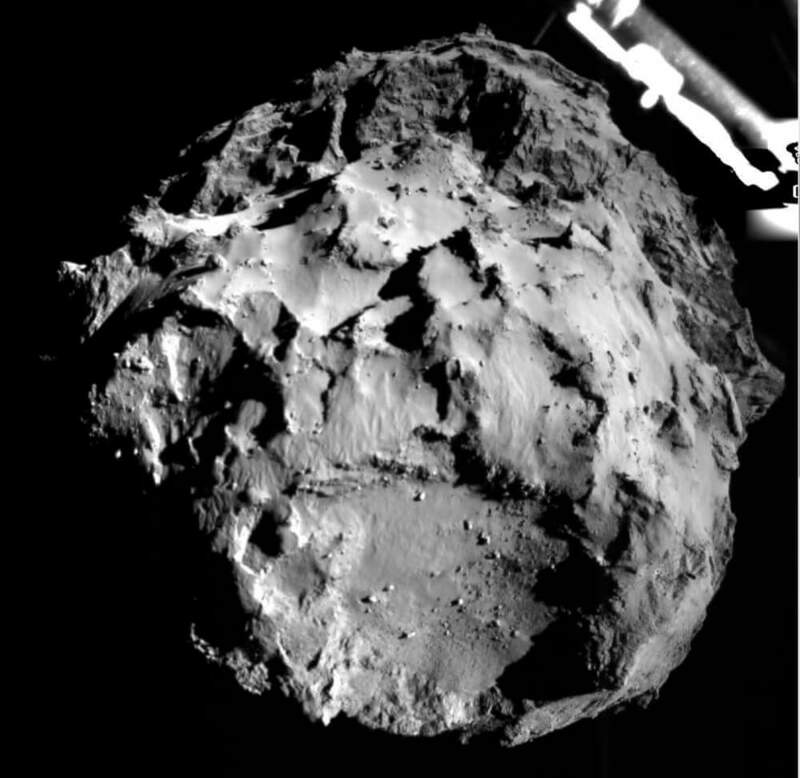 The view from the Rosetta Lander as it prepares to touch down on comet 67P/Churyumov-Gerasimenko. Image courtesy of NASA. 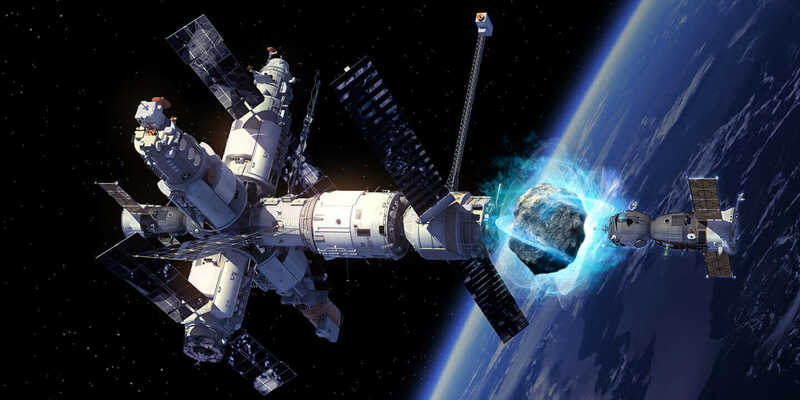 While the initial stages of asteroid mining might be similar, the capture and mining phases of the operation will likely vary, depending on an asteroid’s size, where its ore is located, and how far it is from Earth. Currently, there a few ideas for mining an asteroid under consideration. These include snagging a rock and towing into a safe Earth orbit and sending out harvesting ships to chip off large chunks and return the asteroids to Earth for processing, bit by bit. For me, those ideas are plausible, but they’re also a bit dull. So, since we’re talking about an industry that could potentially change humanity’s relationship with space while also dramatically stretching our ideas of personal wealth, why not come up with a wild strategy for collecting this staggering bounty? I propose that in the future, miners could send a ship filled with self-replicating machines to a target rock, where they’ll swarm across its face to mine and process it simultaneously before returning to their mothership for a journey back to Earth. This could substantially cut down overhead costs through automation, making each mission more profitable. Another idea for early stage asteroid mining might look a bit more like scavenging than deep pit dredging. It’s known that as a result of Mars’ thin atmosphere, asteroids impact the planet without losing too much of their substance. So, similar to the 49ers who found gold nuggets just laying around in California streams during the gold rush, the first people to Mars might be able to mine the minerals that are just laying around on the surface. But regardless of how mining companies will secure their bounty, what exactly will these companies be cashing in on when they reach their destinations? Will this be what asteroid mining looks like? Image Courtesy of DSI. What Will We Mine from Asteroids? If asteroid mining is going to be a successful commercial operation, mining firms will begin looking for elements that are extremely scarce here on Earth. These include gold, silver, platinum, copper, indium, lead, palladium. . .the list goes on. Beyond valuable elements, asteroids could be mined for water to help hydrate other off world ventures like, say, a moon colony, or to replenish our depleted or polluted reserves here on Earth. Another resource that would be valuable to Earth is Helium-3, an isotope that’s a potential fuel source for nuclear fusion. While there is a scant bit of Helium-3 on our planet, our satellite, the Moon, has it in relative abundance. So, if we ever get our fusion reactors online, having a massive store of efficient fuel on our planetary doorstep could enable us to power our planet for generations. While this isn’t an exhaustive list of what could be captured in space, the value of even a single sizable asteroid cannot be overstated. We’re talking about quintillions of dollars, with a NASA estimate putting the entire asteroid belt in the range of $700 quintillion USD. In short, not at the moment. Before asteroid mining comes into its own, a number of technological and economic hurdles will need to be overcome. To begin with, getting to space is still prohibitively expensive for most nations, let alone companies, though SpaceX is hard at work on bringing that price down with its reusable rocket technology. But let’s say that space travel prices do plummet. 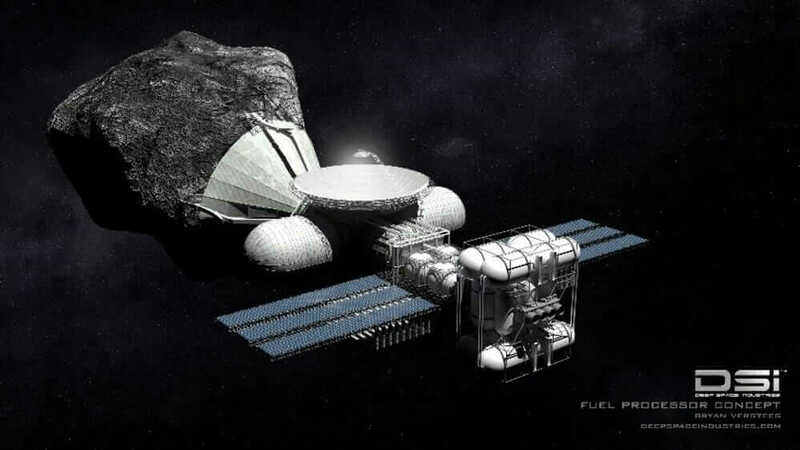 That still leaves asteroid mining companies the heavy lifting of building the necessary off-world infrastructure, like processing facilities that are either in orbit or on another planet. Without these facilities, all the mined material would have to be returned to Earth to be made useful. I imagine that having to make million-mile return trips can only complicate any mining mission and make it less profitable. Beyond those stumbling blocks lays the technological barrier of building equipment that can handle the rigors of space for decades and perform mining operations with little to no supervision. Admittedly, this hurdle is by far the easiest to surmount if you take into account the stellar performance records of NASA’s various rovers. Asteroid mining technology might be accelerated by humanity’s collective need to protect its neck. Moving past technology, the economic component of asteroid mining looms large over any venture. The cost of developing a mining program, prospecting an asteroid, building infrastructure around a chosen body and setting up an efficient operations regime to deliver materials is staggering. In fact, one study pegged the starting cost of asteroid mining to be $100B—roughly the same amount of money dedicated to the entire science and education portion of the 2016 federal budget. So, the dream of asteroid mining is still that, just a dream. However, recent missions by NASA and the ESA do sound out some hope for the near-term success of off-world mining. What’s more, asteroid mining technology might actually be accelerated by humanity’s collective need to protect its neck. Though it’s been known for decades that asteroids can kill, we’ve done surprisingly little to develop the technology we’d need to protect ourselves from an extinction-level impactor. That seems to be changing, as more intensive surveys of the sky and serious endeavors to redirect (read: control) an asteroids trajectory are carried out. But the question remains, will the world’s first trillionaire be born out of the asteroid mining industry? While I can’t say for sure, asteroid mining has the promise to make its pioneers very rich—trillions of dollars rich. Whether that’s a good thing is up for debate. Article by Kyle Maxey. A version of this article appeared previously on Engineering.com.